Indonesian accident investigators of the National Transportation Safety Committee (NTSC) have concluded that a fatal accident involving a DHC-6 Twin Otter in August 2009 has been caused by VFR flight into cloud. The airplane flew into the side of a mountain, killing all 15 on board. The Merpati Nusantara Airlines DHC-6 Twin Otter passenger plane flew into the side of a mountain during a domestic flight from Jayapura (DJJ) to Oksibil Airport (OKL). Merpati Flight MZ9760D took off at 10:15 with an estimated time of arrival at Oksibil of 11:05. The pilots were operating under visual flight rules (VFR) procedures. This required them to remain clear of cloud. Ten minutes before impact the pilot in command mentioned climbing to 10,000 feet, and stated “if we cannot go visual I will turn left”. The cockpit conversations did not exhibit any signs of stress or concern until two minutes before the impact, when the copilot mentioned haze and asked the captain if he could see. Fifty seconds before impact, the copilot expressed further concern and asked about the captain’s intentions, and the captain said “climb, to the left”. Forty-two seconds before impact the copilot asked if it was safe on the left. The copilot became increasingly uncertain about the safety of the flight, specifically mentioning visibility and speed. From the recorded sounds, it is apparent that 13 seconds before impact, engine power was increased symmetrically to a high power setting. 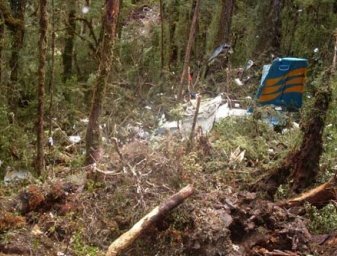 The Twin Otter struck the side of a mountain at an elevation of 9300 feet. The wreckage was located August 4 with some difficulty because the ELT was unserviceable. issued recommendations to address safety issues, specifically with respect to: maintenance procedures and maintenance inspection programs, to ensure that Emergency Locator Transmitters are serviceable; and the provision of weather information services for all civilian aircraft operations throughout Papua.